I kind of felt like Don Johnson circa Miami Vice with my white blazer with the sleeves rolled up on my first day back to school. Truth be told, I wasn't in the market to buy a white blazer, but when I picked this one up from J. Crew for only $35 this summer, I thought it would be a nice basic to have in the closet. As it turns out, white isn't the most practical thing to wear to work (surprise, surprise), especially in an environment that can frequently be dirty, full of unexpected situations and lots of red dry erase markers, but somehow I was able to keep the blazer pristine and intact for today. The next time I wear it, who knows what will happen? My blazer isn't the only thing about my outfit that's new. My houndstooth tote from Target, which I also picked up over the summer, is a purchase that I waited to use until going back to school today. Practically speaking, the tote is nice and roomy, but more importantly, it's houndstooth and I'll buy almost anything that's houndstooth! It's also reversible, which might be more of a curse than a blessing, as I can envision myself frantically dumping all of my stuff out in order to reverse it to the yellow interior to match my outfit early in the morning on my way to work! Probably the most practical aspect of the bag is that it's pleather, so the dirt should wash right out, unlike with my white blazer! I know what you mean - white pieces are SO hard to keep clean! Invariably I always get at least a pen mark when I wear anything white to the office. =P Loving this look though! Thanks for stopping by Amber! Unfortunately white is so chic, yet so impractical to wear! I hope you are also having a fantastic weekend! I have the same dress and also purchased this blazer recently so I will have to borrow this outfit for next time. I have to know...how did you score such a deal on the blazer? I actually just looked at my receipt for the jacket and it's called the "Naomi" blazer, not the Thompson, although I swear it's the same thing. Also, the receipt said the jacket was $29.74 with my teacher discount. I honestly think it was incorrectly marked somehow because I saw it at other stores the same week I purchased mine and it was way more expensive. I guess I lucked out! Anyway, I hope you are having a great weekend! A white blazer is on my current wish list and I just love how you have styled yours. What a great deal you found! 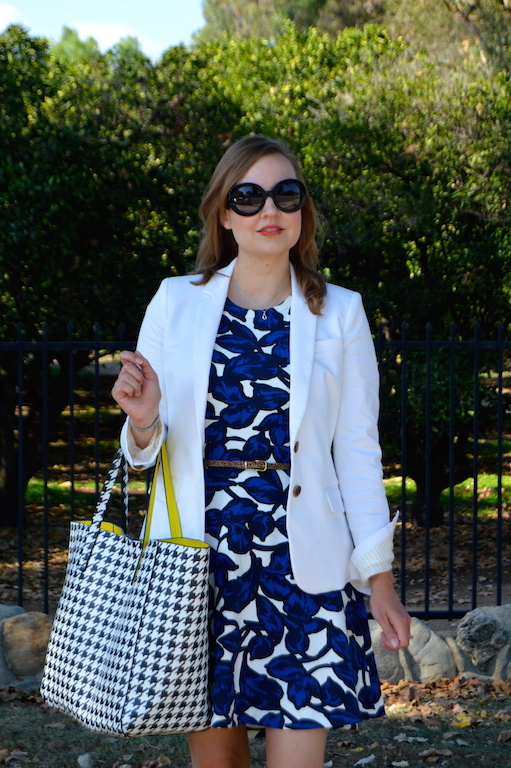 Also loving your houndstooth bag - I Love houndstooth! Yes, even though I didn't want a white blazer, I now see that it opens up so many possibilities! Good luck tracking one down! Thanks for letting me know about the Link Up, I will be sure to stop by next week! That is such a beautiful dress with stunnnnning pattern! Great outfit especially when paired with that white blazer.. crisp and feminine.. love love love!! I definitely think this print from Banana Republic is one of my favorites from spring! Thank you for stopping by! I love your dress. It is so beautiful. You look gorgeous. I recently discovered you and I love your style. I've started following you on bloglovin. Thank you Elisabeth! I appreciate the follow and I followed you back! Have a great weekend! I can't believe you got that blazer for $35! I think it goes perfectly with that dress. Glad you were able to keep it clean! I know! Actually, upon looking at the receipt I realized it was $29! I am pretty sure it was incorrectly marked. I hope you are having a great weekend! Whenever I wear white I feel I always need to say to people stand back from me at least 3 feet so you don't dirty my white clothes. And eating and drinking can be a nightmare. And yet still we buy! That is such a great buy with the bag. Yes, it's funny how we are willing to be so impractical in the name of fashion! Hope you are having a wonderful weekend! Love this dress with this white blazer. You look amazing.